Hangman is a simple game—one of the first non-board strategy games that many children learn. I’ve reviewed quite a few of the hangman games available for the iPhone, some good, some not so much. By far, Hangman RSS is more clever and challenging than the half-dozen or so I’ve tested, both formally and informally. All the News That’s Fit to Solve: Hangman RSS’s puzzles are ripped directly from the most recent news headlines. From Finger Arts, Hangman RSS cleverly uses an RSS (real simple syndication) news headline feed that pumps out the first six or seven words of news headlines, and requires you to play an individual game of hangman on one or more words in the headline. The other headline words are provided, giving you a rough context to work with, but because the news is ever-changing, you’re always surprised by what turns up. Many of the words are quite difficult (but solvable), and one of the challenges of the game is that you have to solve words in the order in which they appear in the headline. Meanwhile, you’re racking up points, trying to make your way from the Easy to Expert level. To advance to the next level, you have to win five consecutive games at the level you’re on, no easy feat (but doable). Meanwhile, at any time you can touch the Dig button near the bottom of the screen and access a scrolling list of all the headlines you’ve solved, each with a brief summary. Another tap, and you can read the entire article connected to any headline. Another option enables you to choose which country you want headlines from, meaning you can play in English, Spanish, French, Italian, and several other languages. 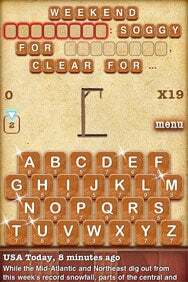 Hangman RSS provides several terrific twists on a time-honored game. It’s not for kids, but both newshounds and word-gamers seeking something more challenging than the typical hangman game with a limited vocabulary are likely to find this small gem to be well worth a buck.